Since PA Day falls on a Saturday this year, we started celebrating one day early! But don't worry - the fun isn't over yet! Leading up to the 5th Annual PA Day, we have highlighted AAPA members at various stages in their PA careers. Catch up on any you might have missed over on our PA Day Blog. For today's Member Spotlight, we are featuring Sarah Garner, MS, PA(ASCP)CM, a 2016 Rosalind Franklin University of Medicine and Science graduate. makes every day different and exciting, and it is important to be able to share that with colleagues. it. It takes a certain type of person to do what we do and love it, and the AAPA brings those rare people together. Being a Pathologists’ Assistant allows me to engage in interprofessional education. As healthcare professionals, we participate in education at some point in our career, whether we work in an academic or private setting. Everyone can be considered a 'student': a patient lost in the hallway or in the waiting room, surgeons asking for frozen sections, technicians, medical students, residents, nurses, PAs, hospital administrators, and even ourselves. In pathology, it is easy to feel detached from the rest of the clinical world, but we must remember that every action we take indirectly affects other members of the healthcare team, and most importantly, the patient. their careers, in turn touching infinite people, which is why I am grateful to be a Pathologists’ Assistant." He's got a Golden Ticket! 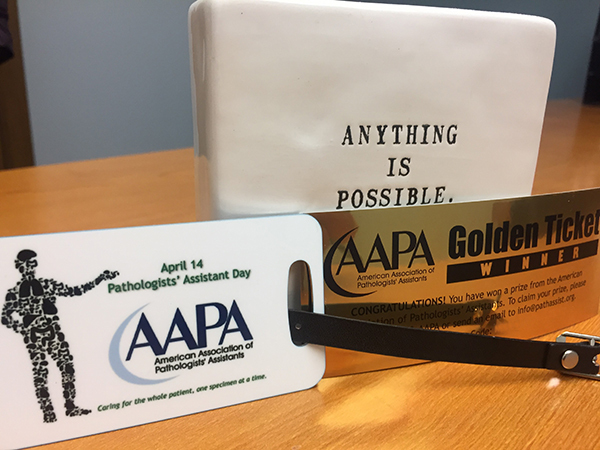 Congratulations to our PA Day Golden Ticket winner, AAPA Fellow member Derek Kingman, PA(ASCP)CM! Derek has won $500 in AAPA Bucks, to be applied toward a future AAPA Conference or other AAPA goods and services. If you haven't yet received your special PA Day bag tag, don't worry - it's on its way!